Palmaria is one of the treasures of Liguria, and you can't escape her. When you visit the sights around the Gulf of the Poets, you'll see her in the distance. She's in every sunset from Lerici, a gray shape on every foggy winter morning in Tellaro, and she will watch you inspect the colorful waterfront of Portovenere. When you cross the channel to court her, you'll see the beauty she sees: the hillside tumble called Portovenere, the juxtaposition of tiny sail boats and giant tankers, the cliffs of the Cinque Terre coast, wild goats under umbrella pines, and views you'll never forget. Palmaria (pal-MAR-i-a) lies across the narrow channel of Portovenere on the western side of the Gulf of La Spezia. Due to its strategic position at the entrance of the great natural harbor of La Spezia, military considerations have always determined its history, and this has left the island largely undeveloped - there are still only 54 residents. The island, along with the Cinque Terre and Portovenere, is a UNESCO World Heritage Site. The two beach areas on Palmaria, Terrizzo and Pozzale, draw a great many visitors in the summer - who wouldn't like the clean water and grand vistas? Year round, hikers and nature lovers visit to enjoy the cliffs, the wild habitats, and the easy solitude given by the wind and sun. However, don't worry about crowded trails. On a beautiful autumn day, we said Salve exactly twice in 3 hours. A Hike Around Palmaria. 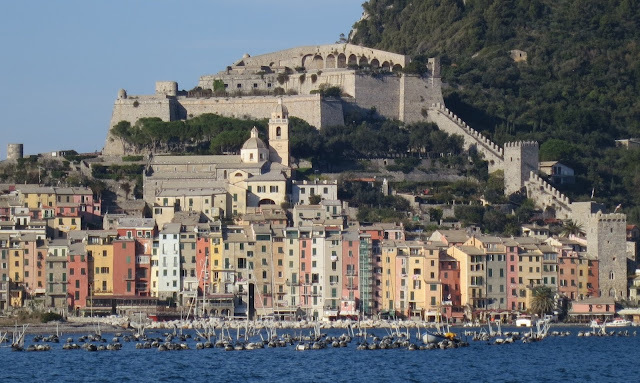 Everything begins from the ferry landing at Terrizzo, just across the channel from Portovenere (see Getting There below). There's a signboard with a map here - and at numerous places on the island - to help you get oriented. We're describing a hike of moderate difficulty, mostly around the perimeter of the island in a clockwise direction. The walk will take about 3 hours including a short picnic. It's not the easiest route, but the most varied, and going clockwise places the sun at your back as you descend the steep section with the best views of Portovenere and the coastline (if you're only interested in those views, head west instead (seaward) along the shore trail). Begin our hike by heading east, toward the mainland. The first landmark is Fort Umberto I, The Fortress of the Sea. Built around the time of Italy's Unification, it's one of a long series of military fortifications in the area, each trying to defend against the newest weapons of the period. Despite the importance, there not much to see but abandoned buildings and a locked gate. 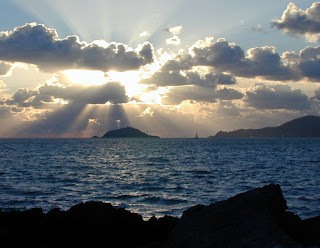 The advantage of the position is obvious, since the passage to La Spezia harbor is close at hand. From the gate, climb the path on the embankment to the right. It's not marked but it rejoins to trail just as you'd expect. Our path then climbs a bit and comes near to the asphalt road that is the easiest way across the island and leads to Fort Cavour in the interior. We walk in a southerly direction along the eastern side of the island and eventually and gradually turn westward. The path leads upward as the landscape changes to Mediterranean macchia with views of the island of Tinto just offshore. Macchia on Palmaria near Portovenere, Tino Island in the background. A Mediterranean Ecosystem. Many areas of Palmaria comprise a distinct native ecosystem referred to as Mediterranean Macchia. It may look like an overgrown field, but it's an intricate environment of plant components which can survive in the rocky soil and withstand the dry, hot summer as well as the intense autumn rains. It is clear that Nature is experimenting because there are many different types of superficially similar grassy clusters and woody shrubs. Similar perhaps for us humans, but don't tell that to the birds, rabbits, and goats. Some plants typically present are arbutus, the ground cover myrtle, buckthorn, holm oak, mastic tree, and locust. 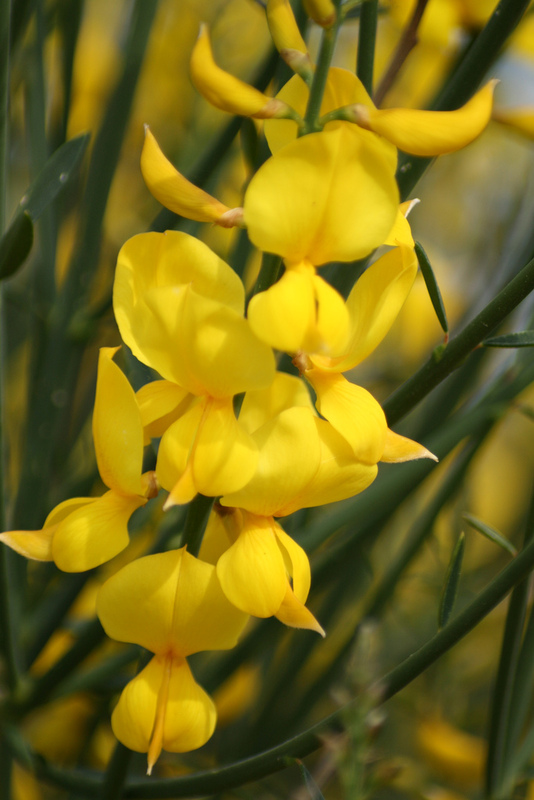 Always present is our favorite - ginestra (broom). It is so sparse, so utilitarian in design with its spiky greenery and little blossoms – yet, almost in apology, it gives us its bright yellow flowers for much of the year. The air carries a memorable scent in the macchia, but it's subtle since the plants can't budget much evaporation. The most aromatic plants found will likely be laurel (bay leaf) and rosemary . For the botanically inclined, the Italian Wikipedia Macchia article has nice reference photos. For comprehensive information and photos of the region's plants and animals, see Escursioni Apuane Flora & Fauna. As you climb, the macchia gives way to terraced fields showing different levels of cultivation, past and present, and there are now more trees. Soon the trail to the beach at Pozzale branches off left (for a longer hike, adding about 90 minutes, walk down to Pozzale and then Capo dell'Isola and then back up to rejoin our route). Our path climbs to the right toward the seaward western shore of Palmaria. When the views open up, the trail turns northward to parallel the coastline. We are now heading up to the former Batteria del Semaforo (lighthouse/cannon battery) now the Centro di Educazione Ambientale (Center of Environmental Education or CEA). The trail is generally across bare rock skirting the steep slopes that mark this side of the island. Unseen below you, midway, is the Grotta dei Columba (access by ladder) where archaeologists have found tools and other evidence of human habitation from the Neolithic era ( that's like 5,000 years ago!). As you gain height you'll see several large Portoro marble quarries cut into distant cliff faces. These modern quarries were active until the early 1980's and were located here to take advantage of water transportation, attractive veining, and lack of fracturing. A rich Portoro Marble example from Palmaria (Portovenere). Portoro Marble Portoro has been famous since antiquity. 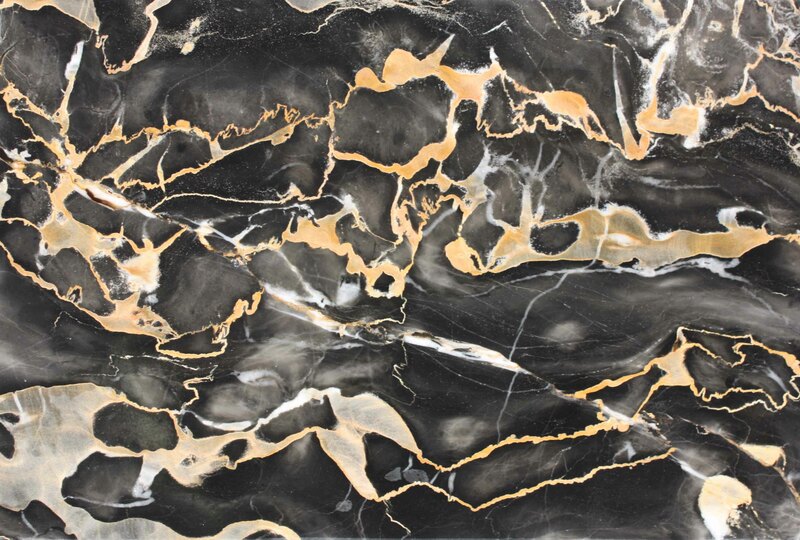 Also known as black-and-gold marble, it is a distinctive black limestone with gold flourishes and white veining. Unpolished, the stone looks gray (Byron's Grotto in Portovenere is Portoro) but when polished by stoneworkers or thousands of feet, it is black. It was quarried from Palmaria by the Romans and used widely - in imperial buildings and villas, as well as in the pavement and amphitheater of nearby Luni. Subsequently the Roman stone was appropriated for use in churches, and, for example, it can be found in Rome in the Basilica of San Giovanni in Laterano. In the 1600's the Roman quarries were reopened and an industry developed for the precious marble in Italy - often as church balustrades and columns (Sant'Andrea church in Sarzana). With Napoleonic control of the area, Portoro began to be used in fine buildings in northern Europe, such as Versailles, often as wall paneling and as a component of fine furniture (the word portoro is an Italian derivative of the French term, porte d'or). Palmaria was the most notable source over the centuries, with at least five quarries above and below ground, including Terrizzo and Pozzale. There were a few other quarries on the mainland including the mountainous area (Il Muzzerone) behind Portovenere, where there's still at least one working quarry today. Palmaria's 500 foot cliffs are a favorite backdrop for sailboats. The CEA is the high point of the island at 186 meters. This is the higher end of the asphalt road, and it's a shady spot to rest. When you're ready, continue along the western side of the island, past yet another old military building. Here the trail is often shaded, and it's the prettiest part of the hike, but also has the steepest section. This is where we encountered the wild goats of Palmaria. We met about a dozen, all of different colors with a variety of distinctive markings and somewhat stunted bodies – earning them the diminutive caprette in Italian. They were very curious about encroaching bipeds, and - just like goats - stubbornly refused to pose for photos. The goats left a distinct chevre odor as they ran down the trail – perhaps not the most appetizing path to lunch. They are an invasive species – a relic of the island's agricultural past, and the Comune would very much like to remove them, but so far the goats are winning the popularity contest. A Palmaria Goat. Click to enlarge. There's an attractive mix of fields and trees here and the trail comes closer to the cliffs, providing wonderful and scary views of sailing ships and sheer drops. These cliffs are 400-500 feet high – so it's little wonder the boats favor this setting - imagine the view they have. There are plenty of picnic places here with Maritime pines (a/k/a Umbrella pines) and Aleppo pines providing lots of deep shade. Some of the cliff flowers occur only here in these unique conditions. St. Peter's, Portovenere. Montale: 'every near hour is ancient'. Without a preview the trail starts to drop, and here attention is required. Parts of this side of the island were used in the lizzatura, the lowering of marble blocks down the hill, and it can resemble a coal chute in places. The slope becomes steep and the combination of loose rocks and pine needles and tree leaves don't provide the good footing you need. Kind volunteers have provided rope handholds in some sections, in other areas, you'll need to be a tree hugger. The very steep section is only about 200 meters long, so go slow, there's a reward at the end. As the trail passes through a rocky excavated area, you start to get glimpses of Portovenere. Here you see the colorful slender buildings, and then there's the Church of St.Peter on its rocky point. The church's location is poetry and philosophy - as Montale said of it, "Here you are at the origins / and deciding is foolish." You will admire and you will walk and as soon as you take one photo, you'll walk 50 feet and there's an even better one. In the distance is the fantastic coastline leading to the Cinque Terre. Little wonder those villages were isolated! The trail descends and curves to parallel the channel. It follows the shoreline past a variety of bad beach architecture to the ferry landing at Terrizzo. Have you tried an Aperol spritz? The Cinque Terre / Portovenere Coast from Palmaria. The boat for Palmaria leaves Portovenere from Molo Doria, which is the first pier from the road (there's a little ticket booth nearby) and it costs 4.50 Euro RT. In high season which is June 15 to September 14, there are many trips so you just show up between 9am and 7pm. In low season, September 15 to June 14, there are at least 9 trips daily. The schedule times posted on Nov. 2012) were 6:15 7:15 10:00 12:00 13:15 14:15 16:15 18:00 and 20:00 (the return is 10 minutes later). There are also affordable water taxi services available in Portovenere, see the Getting to Portovenere link above or inquire locally. They are useful if you have a group, would like to be picked up across the Gulf, or want a customized hike. All of this is subject to change and to rough weather. In high season, there may be a boat that stops at Pozzale while on a tour of the islands, but we couldn't verify it - inquire locally if that's of interest. Most people stay on the mainland, of course, but Trip Advisor's number 1 rated B&B for the area is on Palmaria. La Casa del Pescatore The view is a VIEW! and the dog's name is Leon. Portovenere Travel Guide - The Top Ten Attractions Here's what you should see in Portovenere written by our favorite writers. Pro Loco Portovenere is a pretty good website for a small town. Parco Naturale Portovenere The park website has Palmaria history and trail descriptions (under 'tracks') in English. Restaurants. There are two on the island. Il Pozzale in Pozzale on the far side of the island, and Locanda Lorena in Terrizzo which also has rooms and will send a motoboat to pick you up.